Quince is a fun graphic novel about a girl named Lupe that develops superpowers during her quinceanera. 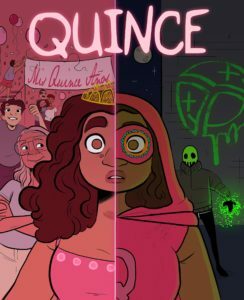 Her newly discovered powers will last her for one year, and as she tries to find a mix between saving people, managing her grades, and trying to find love, Lupe gets into some unique situations. This book, like many of the more successful titles over the past year, is familiar while being original. The coming-of-age tale is one as old as time, but not many are told through the eyes of a girl developing powers during her quinceanera. Constantly unsure of herself, Lupe’s development of superpowers does give her a much needed boost of confidence, but when another kid at her school shows himself to also have powers (leaning toward villainy), Lupe questions her abilities to actually do good. There is great relationship developed between Lupe and her grandmother that shines in this book. Working as her mentor and trainer, Lupe’s abuela guides her through rough patches on her journey while her parents and two siblings are spectators during the process. However, while her grandmother seems to know and understand exactly what Lupe is going through and the rest of the family does not, it is never really explained how or why these things are happening to her. My only criticism of the novel is the font size of some of the dialogue; it is tiny. Like hold the book up to your face because it’s too small tiny. And this is in great juxtaposition to the overly large font in some of the captions and narration. It’s not too bothersome, but I wish there was more of a balance in the text size. I know it sounds like a strange criticism, but it did stick out to me. The rest of the art is fun and well done. It feels Lumberjanes-esque in it’s simplistic style and colorization. The art is very expressive and there is never any confusion as to what us happening on the page. Also…in my future reviews, I will be stating if the book does or does not have page numbers in an effort to let publishers, artists, and writers know that teacher and non-teacher readers want page numbers! If we teach your book, we need page numbers. If we talk about your book in a book club, we need page numbers. This book does not contain page numbers.